The secretary to the judicial commission of inquiry into state capture, Dr Khotso de Wee, has been placed on special leave pending the outcome of an investigation into allegations that he was paid bribes by Bosasa. De Wee has denied the allegations, which are made in an affidavit by former Bosasa chief operations officer Angelo Agrizzi. 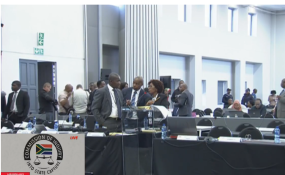 Agrizzi is currently giving evidence before the commission. News24 first revealed that De Wee would be implicated by Agrizzi on Friday morning. In a statement issued after lunch on Friday, Deputy Chief Justice Raymond Zondo confirmed that when he became aware of the allegations against De Wee, he had approached him. "De Wee confirmed that he was the chief operations officer of the Department of Justice and Constitutional Development in 2013," the statement reads. "However, he has informed me that he was never at any stage paid any money by Bosasa or anybody from Bosasa, including the person mentioned in Mr Agrizzi's affidavit." Zondo confirmed that the commission's investigators were probing the allegations against De Wee. "In the light of this and the seriousness of the allegation against him, Dr De Wee has offered not to report for duty - in effect to take special leave pending the outcome of the investigation," Zondo's statement continues. "I have accepted Dr De Wee's offer." News24 reported Agrizzi would testify that he had personally handed cash to politically-connected fixer, Sesinyi Seopela on a monthly basis. Seopela would allegedly distribute the cash to various officials, including De Wee. This was in exchange for a R400m security contract Bosasa subsidiary Sondolo IT had been awarded in 2013, to provide physical security at court buildings around the country. "Pending the outcome of the investigation of the allegation against him, Dr De Wee will stay away from work. It is envisaged that this will be with effect from Tuesday, 22 January 2019, as it is going to be necessary for me to appoint someone as acting secretary of the commission," the statement concludes.